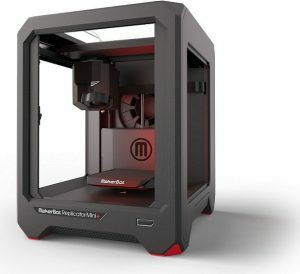 The Hopkins County-Madisonville Public Library maintains a Makerbot Replicator Mini+ 3D printer for use by the public in the Library. The 3D printer is housed at the circulation desk at the Main Library in Madisonville. Click here for a printable copy of the Library’s 3D Printing Policy. Click here for a printable copy of the 3D Print Request Form. 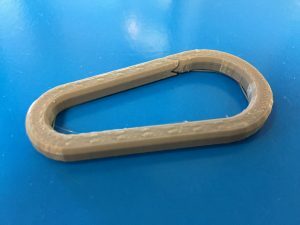 Patrons wanting to use the 3D printer must have a valid Library card in good standing and must read and sign the 3D Printing Policy before being allowed to submit design files to print. 3D printing requests must be submitted in person at the Main Library during the Library’s open hours. 3D printing, also called additive manufacturing or fused filament fabrication, is a process of making a three-dimensional object from a digital file. You begin by creating a virtual design on a computer or by using a 3D scanner to replicate an existing object. Software is then used to digitally “slice” the designed object into hundreds of horizontal layers. 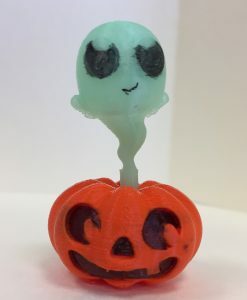 The design is then sent to the 3D printer, where plastic filament is melted through a heated nozzle and laid down layer by layer via a robotic arm. The plastic cools off almost immediately, so the finished object can be handled right away. A short time-lapse video of a 3D printer in action. It depends, but probably longer than you might expect. Depending on the complexity of the design, it may take a few minutes or a few hours. Models that are just a few inches in height can have hundreds of layers of filament and can take hours to build. More intricate models may take just as long, even if they don’t use as much filament. What are 3D printed objects made of? Different 3D printing methods use different types of filament. The two most common types of filament used by hobbyists are ABS (acrylonitrile butadiene styrene) and PLA (polylactic acid). The Library’s Makerbot Replicator Mini+ 3D printer uses 1.75 mm PLA filament. PLA is a biodegradable thermoplastic made from renewable resources like corn starch. While PLA plastic is made from natural, plant-based materials, that doesn’t mean that you can eat or drink directly from something that you’ve 3D printed. Because 3D printing works by laying one layer of plastic on top of another, even the smoothest-looking prints will have tiny cracks and crevices that can act as a haven for germs and bacteria to flourish. The plastic filament itself may also contain contaminants and additives that are not safe for consumption. The Library does not advise eating or drinking directly from objects created using the Library’s 3D printer. Can I use my own filament? Can I donate filament? The specifications of the Library’s 3D printer require us to use only filament supplied directly by Makerbot. This filament was specifically designed and tested to give the highest quality prints on the 3D printer that we have. Different brands of filaments come in very different qualities, and other brands of filament may cause damage to our machine or cause unexpected errors with prints. While the Library will gladly accept donations of funds to go toward the costs associated with the 3D printer (including filament, parts, and general maintenance), we cannot accept donations of the filament itself. Where can I get a file to print? Do I have to make my own models? 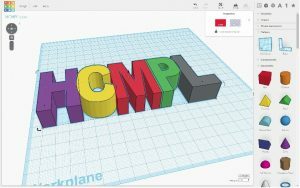 Tinkercad is perfect for beginners looking to create their own 3D models. You don’t have to design your own 3D models in order to use the Library’s 3D printer. You can download ready-made models from popular 3D communities such as Thingiverse or MyMiniFactory. 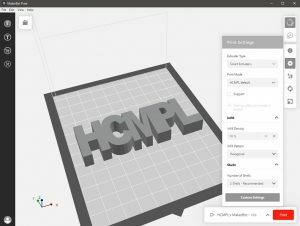 However, if you do want to design your own models, you can create models yourself from scratch (or import and edit existing models) with free, easy-to-use browser-based programs like Tinkercad. For more advanced users, free 3D modeling software such as Blender and Sculptris are available in the Library’s computer labs. See our Computer and Internet Acceptable Use Policy for more information about using the Library’s computers. Patrons are responsible for finding or creating their own models to print; Library staff are available for basic assistance only. Because of the nature of 3D printing, it is best to avoid “overhangs” in your design whenever possible. Each layer of a 3D model needs a base layer below it, so the machine will have a hard time printing something that hangs out into space, like the brim of a cowboy hat. Some objects require support material in order to print correctly (such as models with steep overhangs). All models printed with the Library’s Makerbot Replicator Mini+ require a raft support at the base of the model to prevent warping or dislocation from the print bed. These rafts will be added automatically by our printer software, so you don’t need to add them yourself. Rafts and other support materials are made to be easily removed, but you are responsible for removing them. For liability reasons, library staff and volunteers will not remove the rafts or support materials for you. If a design is too large or complex, the Library may suggest a commercial service for printing. Why support material is important with overhangs. I have a 3D model I want to print. What do I do now? Readying a file for printing in MakerBot Print. 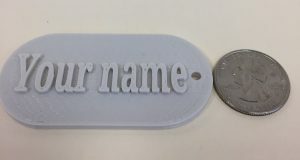 Patrons wanting to use the Library’s 3D printer should bring their file (in .stl or .obj format) on a USB flash drive along with a completed and signed 3D Print Request Form to the Library during open hours. Staff will add the model to the print queue. The file will be readied for printing using the MakerBot Print software. 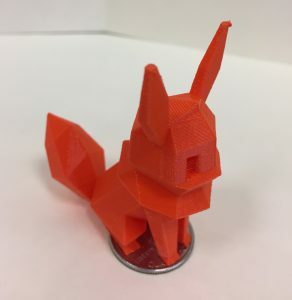 A Library staff member will view the file in MakerBot print before printing and will attempt to select the appropriate printer settings to optimize printing. See Submission Guidelines below for full details. There may be long print queues to use the 3D printer. The Library makes no commitment to being able to produce print submissions within a specific timeframe and will choose the order in which jobs are printed to maximize efficiency and give as many people as possible a chance to obtain a print. If there is a long queue for 3D printing, jobs may not be printed on the day they are submitted. Staff will attempt to give a rough estimate of a timeframe for your print job, but please be aware that this is only an estimate and not a guarantee. 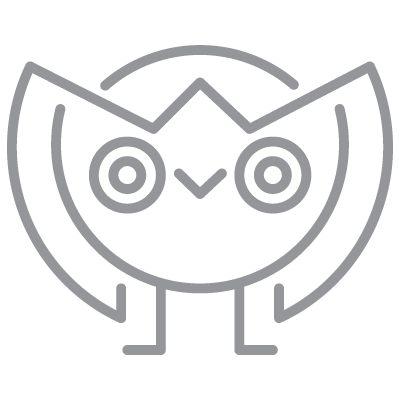 Each request is subject to review, with special consideration given to rapid prototypes for businesses, research, and school assignments. Patrons are not required to stay for the duration of a print job if it is expected to take an hour or longer. Patrons are responsible, however, for coming to the Library to retrieve and pay for their print once completed. There may be times that the printer is malfunctioning, being repaired, or being used for a pre-arranged event or course. During such times, the 3D printer may be unavailable for public use and there will be a delay in approving submissions and printing objects. Any significant lapses in printing time will be noted on this page and on the Library’s Facebook page. The cost of your 3D print depends on its printed weight per gram of filament used (as determined by the Library’s scale), including rafts and supports which may be necessary to print your model correctly but are removed when your print is finished. Models will cost 15¢ per gram for regular filament, and 30¢ per gram for glow-in-the-dark filament (subject to availability). Weight will be rounded to the nearest gram. Library staff will give you an estimated print cost before printing, but the final print cost will be determined by the Library’s scale once the print job has completed. What is infill? What are shells? When you create or download a 3D model, the design itself might look completely solid, but it won’t necessarily print that way. 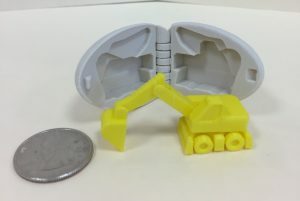 When you go to load a design into a 3D printer, the printer software will allow you to choose how you want to handle the interior of your model. The shell is basically the outer wall of your model. The number of shells determines how thick that outer wall is. Two shells is standard, but using more shells will mean that your object will have thicker walls, which will make the object stronger and sturdier. Infill refers to the amount of empty space vs filled space that makes up the inside of a printed object. 0% infill means that a model is completely hollow, like a ping pong ball. 100% infill means that the model is completely solid, like a block of wood. The amount of infill you use will affect the weight, print time, and durability of the object you create. More infill and more shells mean more filament and a longer print time. It’s a good idea to use a higher percentage infill if your object needs to be extra strong or heavy (like a bookend or paperweight), if you’re going to be drilling screws into your object, if your object will be placed under a lot of physical stress (like a wrench or a couch leg), or if you’re printing a design with a part that needs to snap into something else (like a belt buckle or phone case). It’s a good idea to use less infill if you want to print something fast and cheap or if your object needs to be very lightweight or hollow. You only need to fill these fields in on the 3D Print Request Form if you’re comfortable choosing these settings yourself. Otherwise staff will attempt to adjust these settings to find the best balance of the cost of the printed model and its durability and printability. What does it mean when it asks for dimensions in the 3D Print Request Form? This is referring to what size you would like your finished product to be. 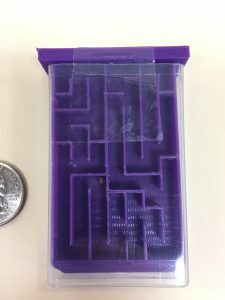 This is in case you designed your object in inches or centimeters instead of millimeters, or if you want the object to be larger or smaller than the size it was designed. We can easily scale models to the desired size while keeping everything in proportion. If you want your object printed at the original size of the design, you don’t need to fill this out. If you’re not sure about the original size of the design, just tell us how long you want the longest side to be. The maximum size that can printed on the Library’s 3D printer is 90mm x 115mm x 115mm (3.5” x 4.5” x 4.5”), adjusted for rafts. My print didn’t come out exactly like I expected. What happened? 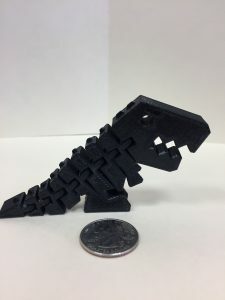 Due to the nature of 3D printing, no file is guaranteed to print successfully, and minor flaws and imperfections can be expected, such as small cracks, bumps, holes, rough edges, etc. The Library will not refund any prints with minor imperfections, but staff will do its best to notify patrons if they believe a print is likely to have imperfections when they review the print for approval. Some imperfections can be cleaned up using fine sandpaper or other tools. Files must be submitted in person at the Library during the Library’s open hours. Files should be submitted via USB flash drive along with a completed and signed 3D Print Request form. Printing is limited to one file per person at a time. Additional requests should not be submitted until the previous request is finished and picked up. In order to fit on the 3D printer’s platform, the design to be printed must be no larger than 90mm x 115mm x 115mm (3.5” x 4.5” x 4.5”), adjusted for rafts. Rafts will be added automatically in the MakerBot Print software right before the design is printed. You do not need to add rafts yourself. Files must take less than 6 hours to print, and must be completed during normal Library operating hours. No printing will be scheduled within one hour of closing time. Files must be submitted in .stl or .obj format. Files containing more than one object are permitted, as long as the total printed dimensions do not exceed 90mm x 115mm x 115mm (3.5” x 4.5” x 4.5”). Multi-part models (that are assembled to create one finished design) may need to be split up into multiple job sessions, depending on the complexity of the design and the number of pieces. Printing of complex multi-part designs requires special approval by designated staff. Before printing, staff will review submitted files in our 3D printer software, checking for noticeable issues/errors, double-checking build size, and determining whether the models will require supports. If your file needs to be resized or if there are other concerns about the quality of the print, Library staff will contact you to discuss options before printing begins. Patrons will be contacted upon completion of their print. If the patron who requested the print is not in-house when the print job is completed, a fee for the cost of the print will be charged to the patron’s library account. Items unclaimed after 14 days will become property of the Library and may be discarded or sold at that time. Items must be picked up by the individual who printed them, unless a designated proxy was indicated on the request form. All submitted files will be deleted from the Library computer system once the print job has been completed. Patrons are responsible for keeping up with their own backup copies of submitted files. The Library does not guarantee a successful print. Except in cases of machine error, the cost of the completed print, regardless of quality, will still be charged. Not all colors of filament are guaranteed to be available at all times. The Library’s 3D printer can only accommodate single-color prints. The Library reserves the right to refuse any 3D print request for any reason. Note: The photos below are actual finished products printed using the library’s Makerbot Replicator Mini+. The information provided for each print job is for informational purposes only, to give you a frame of reference for the print times and costs that you might expect. Most of these models can be found on sites like Thingiverse, and some were made by HCMPL staff using Tinkercad. The costs listed for each item are based on the final printed weight of each item, including support material. The Library is not responsible for the subsequent safety or integrity of an item made with the 3D printer. The Library is not liable for injuries, property damage, or failure of function caused by objects or materials made through the utilization of the Library’s 3D printer. Is prohibited by local, state, or federal law. Violates any of the Hopkins County-Madisonville Public Library’s policies. Is unsafe, harmful, dangerous, or poses an immediate threat to the well-being of others, or that is intended to physically harm or attempt to harm a person or animal in any way. Is obscene or otherwise inappropriate for a public setting. Violates or infringes upon a patent, trademark, copyright, or other intellectual property right. It is the patron’s responsibility to assure that their print job abides by all relevant intellectual property laws; by submitting files, the patron agrees to assume all liability for, and shall hold the Library harmless in, all matters related to patented, trademarked, or copyrighted materials. Supervision of the use of the 3D printer by Library staff does not constitute knowledge or acknowledgment of any apparent or unapparent final use of the 3D model, and the Library specifically disclaims any knowledge thereof. Please be aware that print jobs may occur within public view and that the Library does not make any promise that any particular print will not be seen by members of the public. 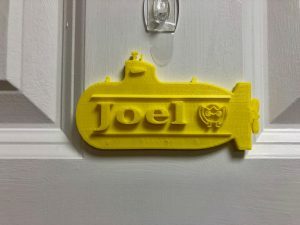 However, we do consider that the identity of the submitter of a print job will fall under the same legal protection that extends to the privacy of the intellectual content of borrowers of Library materials, and therefore the Library will not offer or provide information about a 3D print submitter to third parties, unless specifically requested by the submitter. Except in cases of machine failure, objects failing to print, errors in the print process, or other factors not in a patron’s control, patrons are expected to pay for completed objects and may not demand a new print in place of the original due to dissatisfaction with color, scale, quality, design, required support material, or other options pre-selected by the patron. The user is responsible for all errors that occur during printing involving the .stl / .obj file and the design of the model. If the object does not print correctly due to design errors, it is still the responsibility of the user to pay for the object. It is recommended that before you submit your file for printing, you utilize a software that checks for errors and helps repair them.